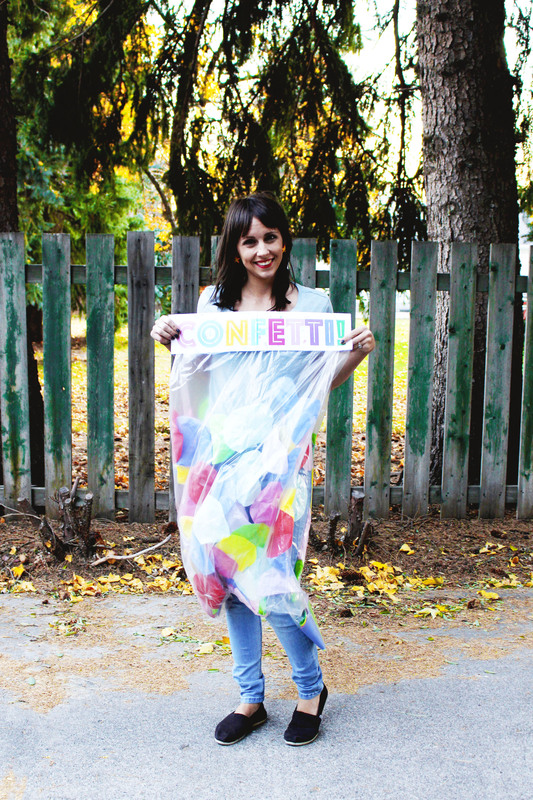 My confetti costume was easy to put together! I don’t even have a full DIY for it. All I did was buy 39-gallon “lawn and leaf” clear trash bags at the grocery store and a stack of multi colored tissue paper from Dollar Tree. I traced a bowl on the tissue paper and cut out a ton of circles. I ripped two openings for my legs (do them smaller than you need cus your legs will stretch them out a bit each time you wear it) in the trash bag and slipped it on. Next we placed a round of clear tape on a lot of the circles and stuck them all around the inside of the bag. Just dumping them in there doesn’t work unfortunately. I think if you used construction paper or card stock and A LOT of circles, that method may work. But the tissue paper just crumpled down into the bottom of the bag and fell out the leg holes! I think it was worth it for the cost and ease of cutting to use the tissue paper and tape method though. After covering most of the bag, we did just dump in what was left so some was floating around the bottom. I placed this bag topper over the front of my trash bag and then stapled the bag to it, brining the back of the bag around to it as well so it would be tight to my body. That’s it! I feel like that sounds more complex than it was haha. 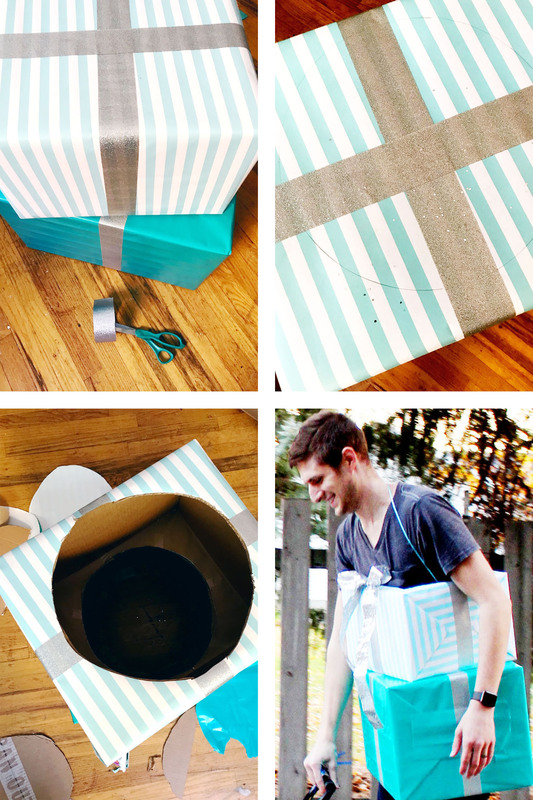 Wrap two boxes in coordinating wrapping paper. Tape them together on top of one another. Use colored or glitter duct tape for the “ribbons” around them. Trace a large circle on top of the top box. Cut it out with Xacto knife. Trace the circle onto the bottom box and cut out. Poke a hole through both sides of the top box. String a ribbon or twine through them and use it to go around the wearer’s head. Place a pretty bow on the front of the boxes! 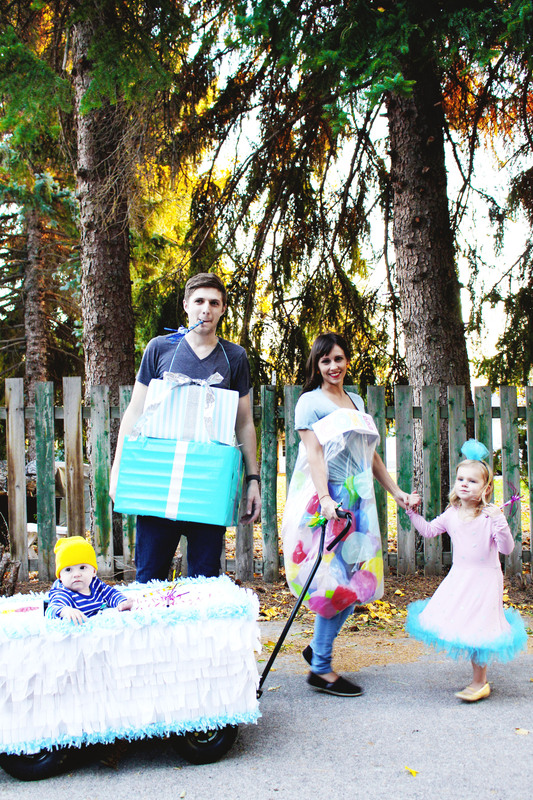 The DIY Party Hat Costume we did a couple years ago is basically exactly what I did here! Except I found a polka dot dress and that made it a lot easier! (It’s from H&M). You want to find a dress with some flare at the bottom. Skater style dresses are perfect. 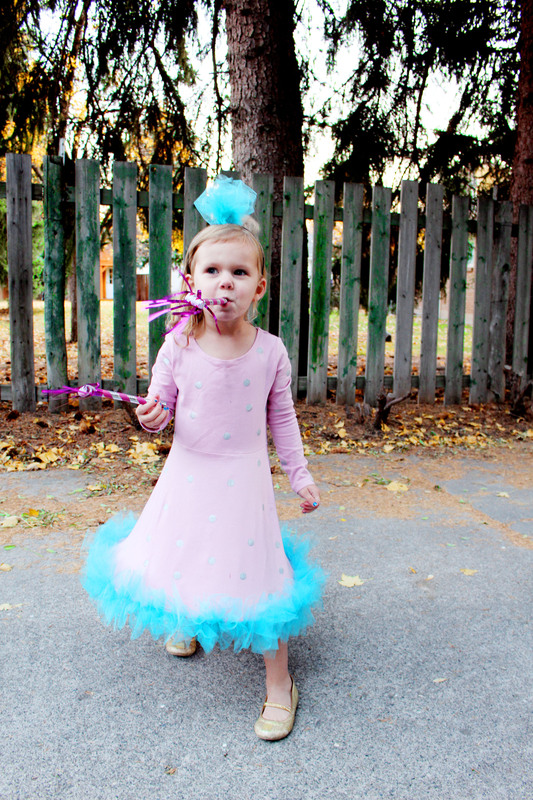 Michael’s has mini hula hoops that are perfect for this party hat costume in a kids size. And finally the star of the show! I modeled this after a typical birthday sheet cake but feel free to use whatever colors you like! For me, a box this size was going to run something like $25. Which seemed ridiculous to me, especially since I have so many boxes lying around myself! So I DIY’d! I ended up cutting pieces of cardboard for the sides and using white foam board for the top. I taped it all together with duct tape as some other tapes are not strong enough. Be sure to leave space up top for the child to sit in! Next I covered the whole thing in a bunch of white crepe paper. 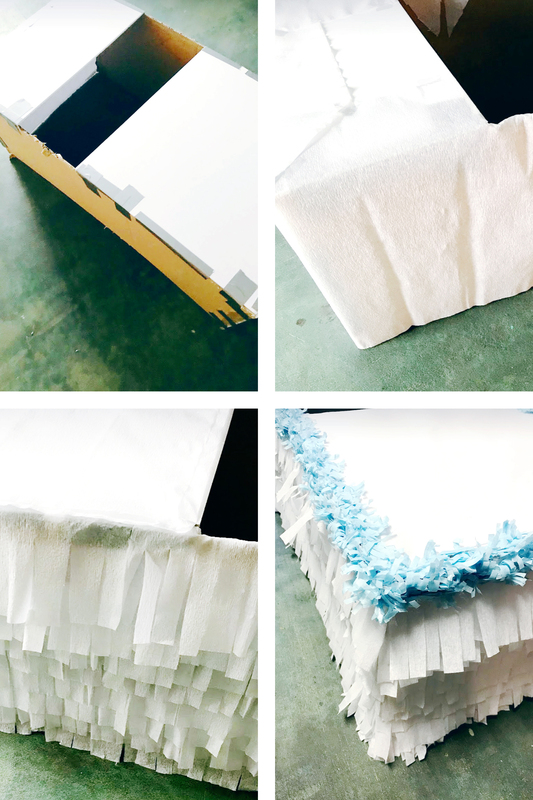 Then I fringed the sides also with white crepe paper! Next, blue festooning went around the top and bottom edges of the cake to make icing. Lastly, I took colored sharpie markers and wrote “Happy Birthday!” and drew a bunch of sprinkles and balloons on the top of the cake. It slipped right over my wagon and held in place as is since the top is covered! For the birthday candle costume, any striped or plain colored top will do and a yellow beanie! 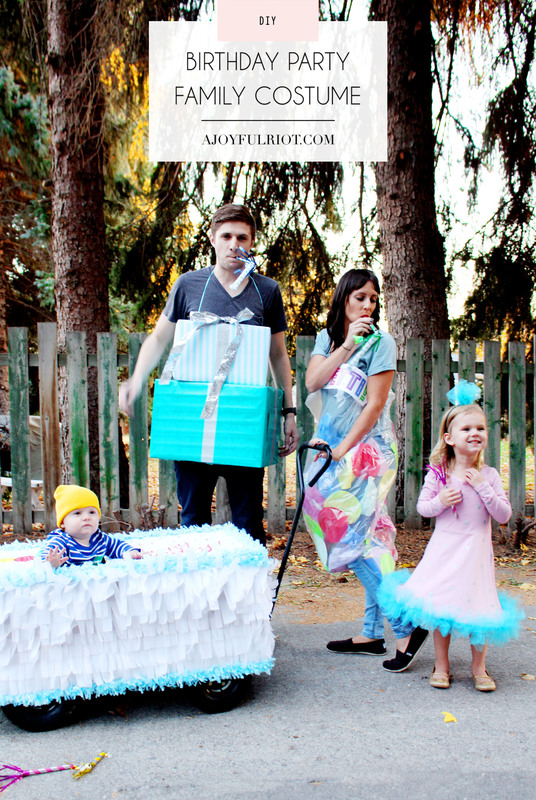 There are some other cute birthday candle costumes out there you could refer to as well! 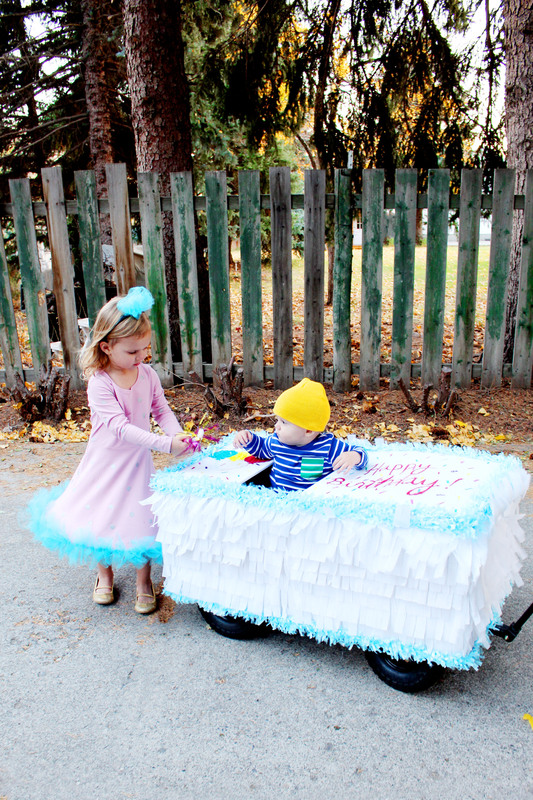 To see more cute pictures of the birthday boy in his costume, see his Halloween Carnival Birthday Party! Whew! I wish we had gotten pictures of it all when it wasn’t so windy and cold and Otto wasn’t so tired (can you tell in these photos?! haha) But I’m just happy we managed to get them at all. 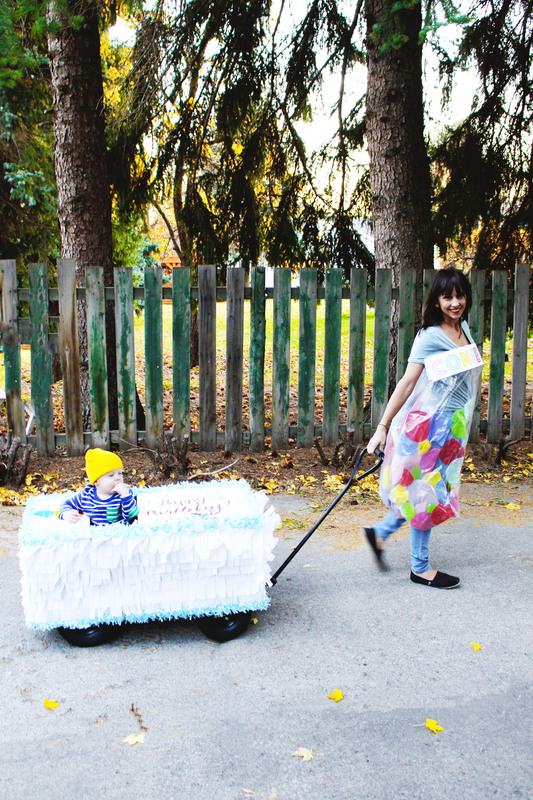 It was a fun costume and it worked so well for his first birthday, which was a Halloween-themed carnival that I will be sharing soon! Which costume from the group was your favorite! ?